Licensing officers from South Gloucestershire Council teamed up with traffic officers from Avon and Somerset Police yesterday (Tuesday 4 August) for a joint operation to carry out checks on hackney carriages and private hire vehicles. Police officers stopped the targeted vehicles and directed drivers over to a checkpoint area located at The Jubilee Centre in Bradley Stoke. Upon arrival, routine compliance checks were given on the vehicle’s condition/roadworthiness and the driver’s licensing and insurance documentation. A number of drivers were also breath tested for alcohol. A total of 29 vehicles operating in the Bradley Stoke, Filton, Almondsbury, Patchway and surrounding areas were directed to the checkpoint area. None of the drivers were arrested and no drivers failed breath tests. However, several were issued with prohibition notices for faults such as defective lights or tyres; four vehicles were given PG9’s (Police prohibition notices) or Stop Notices (council prohibition notices) and of these all but one were rectified and the vehicles are now back operating. Only 13 of the 29 vehicles/drivers checked were found to have no issues regarding compliance. 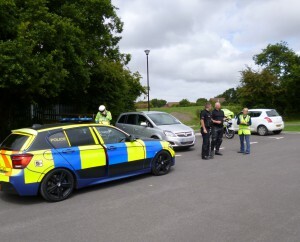 The aim of the joint operation was to ensure compliance of licensed vehicles, operators and drivers working within the South Gloucestershire Council area. The checks included both hackney and private hire vehicles licensed by South Gloucestershire Council as well as those licensed in other local authority areas but operating within South Gloucestershire.